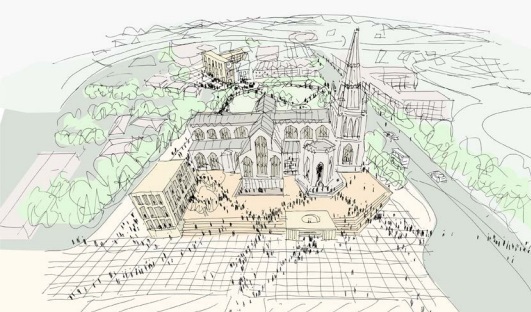 St Mary Redcliffe announced today (June 2, 2016) that Purcell has won the St Mary Redcliffe Design Competition. 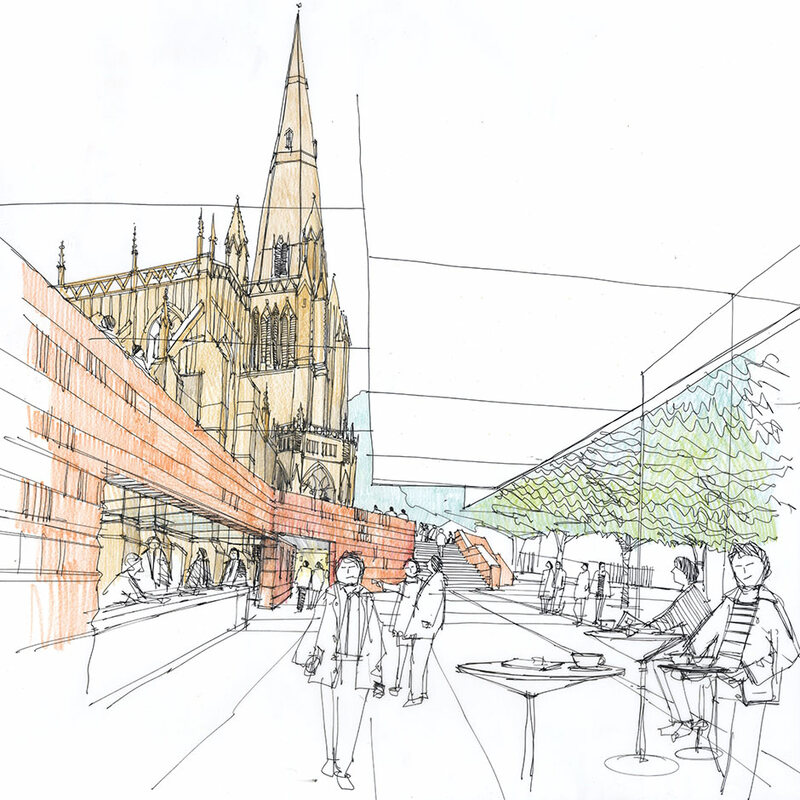 “The Jury was very impressed by the finalists’ presentations, their enthusiasm and good ideas, but ultimately, Purcell demonstrated the deepest understanding of the site and context and the opportunity at St Mary Redcliffe. 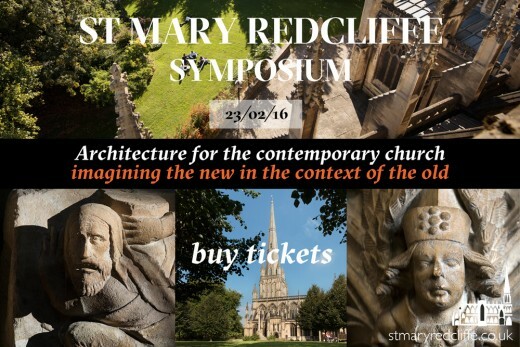 “Purcell is delighted to work with St Mary Redcliffe. 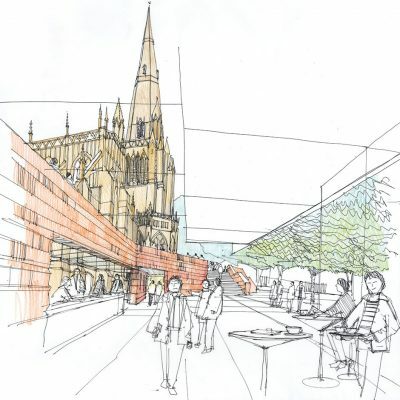 For the church, this project represents a once-in- a-lifetime opportunity to repair the fault lines that exist in Redcliffe’s urban fabric and, in doing so, to position the church at the physical, spiritual and social heart of the city. The Grade I listed Bristol church, both a national landmark and a living church, is the equivalent of many European cathedrals and one of the largest parish churches in England. 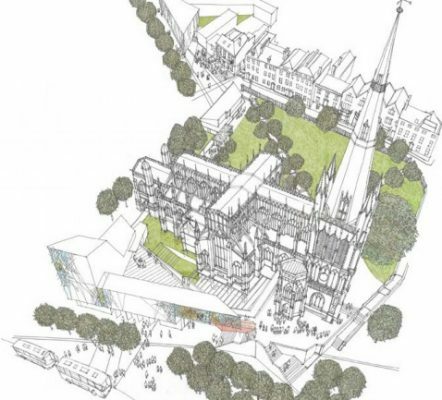 The £12-15m development project will give the church much needed visitor amenities, step-free access, and a community hub on a separate site or sites in the heart of the Redcliffe area. The initiative is linked to wider regeneration plans, placing the church at the heart of a new urban village within the city centre. The concept design images can be viewed on the competition website. Fifty-three practices entered the competition and of these international studios accounted for nearly twenty per cent. The competition jury included journalist, broadcaster and author Simon Jenkins; Bristol-based contemporary artist Luke Jerram, who was responsible for the Park and Slide installation which turned Bristol’s Park Street into a giant water slide; and Vicky Smith, the new city design manager for Bristol. 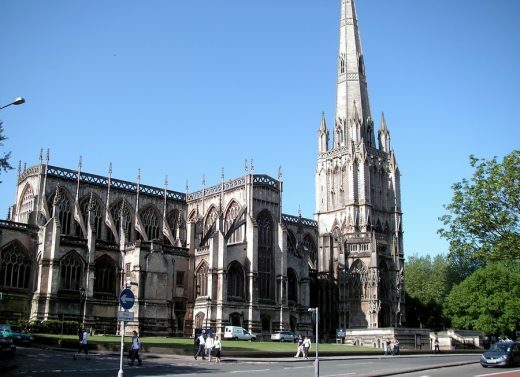 St Mary Redcliffe is notable for its connection with many important historical figures, including George Frederick Handel and Samuel Taylor Coleridge. It has links with America through artefacts relating to John Cabot’s voyage of 1497 and Admiral Penn – the latter, the namesake of Pennsylvania, is buried within the church. Elizabeth I described St Mary Redcliffe as ‘the fairest, goodliest and most famous parish church in England’. The church attracts tens of thousands of visitors and tourists annually. Built, and then re- built, over a 300-year period from the early 13th century to the 15th century, the church embodies magnificence, but has always lacked sufficient community and support spaces for its vital work in one of the most deprived wards in the country. Purcell was founded in 1947 and is one of the top-ten largest architectural practices in the UK. We have 15 offices in the UK and in emerging markets overseas. Our reputation has been built on heritage expertise, local knowledge and award-winning design skill. Purcell is currently working on high profile national projects such as Battersea Power station, the Palace of Westminster and the National Gallery. 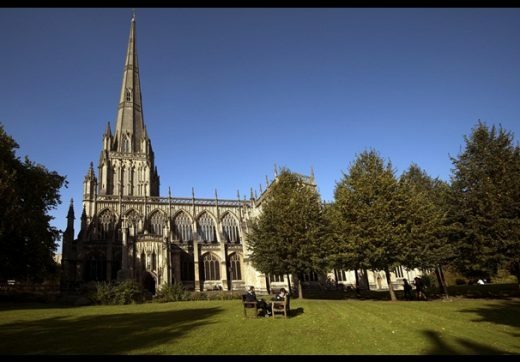 We also care for and help develop many of the country’s most loved places of worship such as Salisbury, Durham and Canterbury cathedrals. From our Bristol office we have been responsible for the award winning regeneration of Arnos Vale Cemetery and the Bristol Architecture Centre, and in the local region our award-winning projects include Tudor House Museum in Southampton, the Welsh Wildlife Centre, Wells Cathedral Visitor Centre, the Hyde at Dillington House and the Shropshire Hills Discovery Centre. Our current projects in and around Bristol include the exciting roof experience project at Dyrham Park Mansion for the National Trust, the new Concorde Museum and Bristol Aero Collection at Filton Airfield and the major repair project at Clifton Cathedral. We believe in new, innovative and imaginative design to compliment the quality of historic buildings. We support clients with our expertise and funding acumen, and we offer enthusiasm, skill and commitment. Our supporting consultants work with us regularly. Not only are they experts in their fields, but they have a passion for their roles which is infectious, and fills us with excitement on what we can jointly achieve. 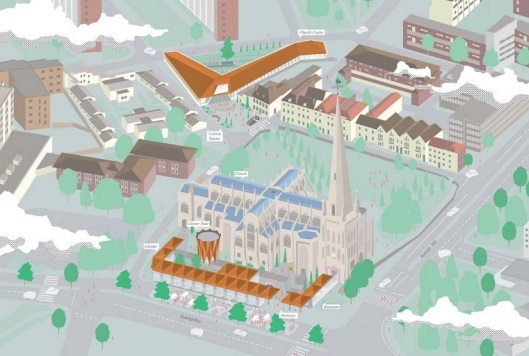 St Mary Redcliffe released images of the shortlisted concept designs produced by the five award-winning design teams competing to win the St Mary Redcliffe Design Competition. Fifty-three architecture practices entered the competition and of these international studios accounted for nearly 20%. 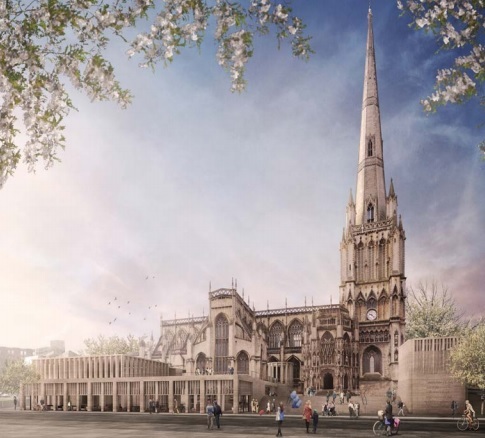 The decision of the selection panel which included representatives of the jury, St Mary Redcliffe and competition organisers, Malcolm Reading Consultants was unanimous. The competition is being run in accordance with European Union procurement guidelines under the Restricted Procedure. The competition jury includes journalist, broadcaster and author Simon Jenkins, and Bristol-based contemporary artist Luke Jerram, who was responsible for the Park and Slide installation, which last year turned Bristol’s Park Street into a giant water slide. Malcolm Reading will advise the jury. 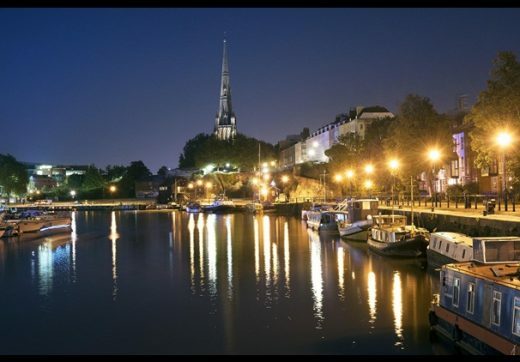 The Christian community has worshipped continuously on the site occupied by St Mary Redcliffe Church for nearly 900 years. The first church here was built in the early 12th century. The present church is a treasure of international importance. A Grade I listed building that is a masterpiece of Gothic architecture – a wall of glass surmounted by a roof of glittering gilded roof bosses of exquisite beauty, elegant 18th century ironwork, carved wood and stone, all framed by light flooding in through vast clerestory and stained glass windows. The oldest parts of the present building date from 1185 although most of the nave, transepts and choir was created by highly skilled yet unrecorded stonemasons in the 14th century. The building’s floor plan is the traditional cruciform shape – symbolic of the cross used for crucifixion, the Roman method of execution by which Jesus Christ died. The physical location is fundamental to the historic maritime and mercantile importance of Bristol generally and the district of Redcliffe in particular. To the north side of the church lies the line of the medieval Portwall, to the west the quayside and harbour plus the red coloured sandstone cliffs from which the area derives its name. Indeed the church’s boundaries to west, south and east have remained fundamentally unchanged from its medieval plan. All of this makes the location itself of both national and regional significance. 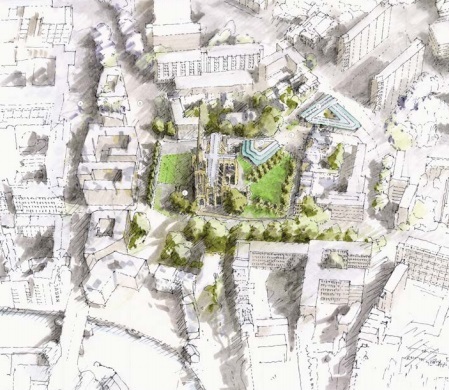 London-based Malcolm Reading Consultants (MRC) is a strategic architectural consultancy which specialises in the selection of contemporary designers. MRC believes in the power of design to create new perceptions and act as an inspiration – whether at the local level, or internationally. The consultancy offers a service to find the very best designers for clients with capital projects, whether through open-international, or private-invited competitions. Recent competitions include those for the Guggenheim Helsinki, the Art Mill, Qatar, Queen Elizabeth Olympic Park’s Culture & Education Quarter, the Mumbai City Museum, the gold medal-winning UK Pavilion at Milan Expo 2015 and New College, Oxford.